Nobody can call me a friend of grunts and splatter, hyperfast metal. 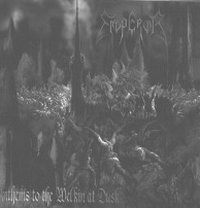 Anyway, it seems that Emperor know exactly what they present on Anthems To The Welkin At Dusk and when I compare the latest release of the Scandinavians with genre releases, they can compete with bands like Dimmu Borgir and Cradle Of Filth. A high quality release.